Horseshoe Valley Resort near Barrie, Ontario is one of my favourite wedding venues and has been a playground for me for many years – skiing as a teenager right up to weekend golfing retreats with buddies. It’s a very popular destination in the area for good reason – simply gorgeous! Lori and Kyle reached out to me ages ago and from that first meeting it was clear I had to shoot their wedding. They’re down to earth, hilarious, motocross riders and head over heels in love with one another… my kinda couple! 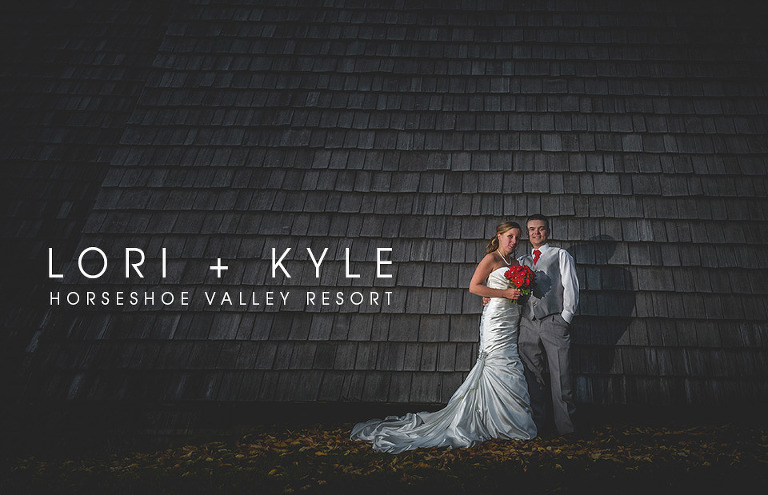 After kicking things off with their motocross themed engagement shoot – it was showtime up at Horseshoe Valley. Lori: Everything… the whole day was amazing, the atmosphere was perfect, food was great, people were happy and everyone was in great spirits! People always say the day of is going to be hectic and stressful, well… not on my end it wasn’t… All the girls were a lot of energy and the only issue that arose was kept a secret from me until minutes before leaving my house, and was luckily solved by the time I arrived at the venue, otherwise the day was smooth and stress-free! The kids had such a good time throughout the whole day, they made the day that much more fun for me, and they have never looked cuter than they did all dressed up and holding hands with great big smiles on their faces! Couldn’t have been a better day! Kyle: Becoming a husband and a step dad. The whole day was exactly what we were hoping for – a great big party! Lori: I can’t just pick one… so I’m going to pick 2 moments from the whole day that were my favorite. They would be Kyle’s face when the kids and I walked down the aisle and he saw me for the first time, and our first dance… I have to say, I was most stressed about the dance… but I’m pretty sure we ROCKED IT! Kyle: My most memorable moments were the speeches, the kids and Lori walking down the aisle looking stunning, and the wonderful support from our friends and family. Last but not least our first dance to Hey You by Pink Floyd. Lori: He’s everything I could ever want in life and more! Every day is an amazing day with him and our family, I couldn’t have asked for a more perfect man if I tried. Since our wedding day I don’t think either of us has stopped smiling and laughing with our family, even if there is an issue we are dealing with. It’s as if even the kids know that since the wedding our family is one unit and it has changed everything in our household and made us more complete. My kids have a new dad, and his son has a new mom, we wouldn’t change anything! Kyle: Lori is very passionate and is a handful… but she’s an amazing mom that takes control – she’s no lazy woman. When dating I always wanted a wife that perfectly describes Lori. She does laundry, dishes, cooks / lunches, cleans etc and when all that’s done she says let’s do an addition on the house, and maybe we could do a new deck, and during that time we should start a company….the list goes on. Lori never stops, sometimes overwhelming but she motivates me to do more and supports my crazy ideas and supports me in every way possible. My boss is very close to me and he one day said “Kyle find a woman that enjoys the things you enjoy, and the same life style you want”, so Lori is not just my wife but my best friend, we dirt bike together, shoot guns, hot tub ;) , etc etc. Don’t sweat the small stuff and nothing needs to be perfect. Looking back there are things I focused on that really weren’t that important – and to be honest, the people that are coming to your wedding are coming for you, not to judge how pretty your table is. Just have fun! Before the wedding it can be extremely stressful and that’s the time your future wife will need the most support – try not to ask what they need help with but think about what things you can do to help. Don’t think why is she stressed out and emotional but be compassionate and try to relieve her stresses with a to do list they actually want. Lori: If it doesn’t feel right, don’t do it… If you don’t feel the “click” with your vendors, then they probably aren’t the right vendor for you. Example, our photographer… when we met him, it clicked, he was amazing and everything turned out great because he was the right person for us! Don’t settle for less than you want just because it’s cheaper or you feel pressured. Besides, you only get to do this once in your whole life!! The food was amazing! I can’t say enough good things about the food! I was a bit picky and customized a couple things, and they did it perfectly! They had my preferred drink served for me only that they had to bring in special and they served it at the temperature I like… how many bars do you know that would do that? The staff was really great and they were very flexible with a few last minute seating changes. I haven’t heard anything negative from any guests about the staff or the venue. Pay for the open bar…this event won’t happen again so make it worth it. Hair & Makeup: Brennen Damelo (Jennifer Roy) = AMAZING!!!! DJ: G N B Sharpshooters (Gord Richardson) *They also do bartending at events. They DJ’d and bartended our buck and doe. Dress: Helen’s Bridal, they were amazing and so great to work with, as was their seamstress. Suits: Timpano’s, again, they were amazing and very accommodating for our out of town groomsmen. Decorator: Well, that one I’ll take a lot of the credit for! Centre pieces, stage construction, name plates, table numbers, ect. were all done by Kyle and I and our amazing bridal party and friends!! Horseshoe Valley Resort supplied the food, bar, and linens.